For other uses, see The Dark Tower (disambiguation). The Dark Tower is a series of eight books written by American author Stephen King that incorporate themes from multiple genres, including dark fantasy, science fantasy, horror, and Western. It describes a "gunslinger" and his quest toward a tower, the nature of which is both physical and metaphorical. The series, and its use of the Dark Tower, expands upon Stephen King's multiverse and in doing so, links together many of his other novels. In addition to the eight novels of the series proper that comprise 4,250 pages, many of King's other books relate to the story, introducing concepts and characters that come into play as the series progresses. A film based on The Gunslinger and also serving as a sequel to the events of The Dark Tower due to the nature of said book's ending was released in August 2017. Stephen King saw The Dark Tower series as a first draft, initially planning to rewrite it to eliminate continuity errors. However, after revising The Gunslinger, "he is trying to decide how much he can rewrite." In the story, Roland Deschain is the last living member of a knightly order known as gunslingers and the last of the line of "Arthur Eld", his world's analogue of King Arthur. Politically organized along the lines of a feudal society, it shares technological and social characteristics with the American Old West but is also magical. Many of the magical aspects have vanished from Mid-World, but traces remain as do relics from a technologically advanced society. Roland's quest is to find the Dark Tower, a fabled building said to be the nexus of all universes. Roland's world is said to have "moved on", and it appears to be coming apart at the seams. Mighty nations have been torn apart by war, entire cities and regions vanish without a trace and time does not flow in an orderly fashion. Sometimes, even the sun rises in the north and sets in the east. As the series opens, Roland's motives, goals and age are unclear, though later installments shed light on these mysteries. For a detailed synopsis of the novels, see the relevant article for each book. Along his journey to the Dark Tower, Roland meets a great number of both friends and enemies. For most of the way he is accompanied by a group of people who together with him form the Ka-tet of the Nineteen and Ninety-nine, consisting of Jake Chambers, Eddie Dean, Susannah Dean, and Oy. Among his many enemies on the way are The Man in Black, Mordred, and The Crimson King. King created a language for his characters, known as the High Speech. Examples of this language include the phrases Thankee, Sai ("Thank you, Sir/Ma'am.") and Dan-Tete ("Little Savior"). In addition, King uses the term Ka, which is the approximate equivalent of destiny, or fate, in the fictional language High Speech (and similarly, Ka-tet, a group of people bound together by fate/destiny). This term originated in Egyptian mythology and storytelling, and has figured in several other novels and screenplays since 1976. The term also appears in King's short story, "Low Men in Yellow Coats", in which Ted describes its meaning to Bobby. While the series was declared finished with the publication of the seventh volume in 2004, King described in an interview in March 2009 an idea for a new short story he'd recently had: "And then I thought, 'Well, why don't I find three more like this and do a book that would be almost like modern fairy tales?' Then this thing started to add on bits and pieces so I guess it will be a novel." According to King, the idea was a new Dark Tower novel. King said, regarding The Dark Tower, "It's not really done yet. Those seven books are really sections of one long über-novel." Stephen King confirmed this during his TimesTalk event at The Times Center in New York City on November 10, 2009, and the next day King's official site posted that King would begin working on this novel in about eight months, with a tentative title being The Wind Through the Keyhole. King noted that this novel would likely be set between the fourth and the fifth books of the series. The book, titled The Dark Tower: The Wind Through the Keyhole, was announced on Stephen King's official site on March 10, 2011, and was published on April 24, 2012. In July 2016, director Nikolaj Arcel confirmed that the Dark Tower film would be a sequel to the novels as well as a direct adaptation, with Roland in the next cycle of his journey to the Tower. Each book in the series was originally published in hardcover format with a number of full-color illustrations spread throughout. Each book contained works by a single illustrator only. Subsequent printings of each book in trade paperback format usually preserve the illustrations in full, except for books I and IV. Pocket-sized paperback reprints contain only black-and-white chapter or section header illustrations. Michael Whelan; The Dark Tower is among his early notable works. Phil Hale – the only Dark Tower illustrator who created a second set of illustrations for a later printing of the book he illustrated. Dave McKean – the only Dark Tower illustrator to work in photocollages. Jae Lee – an illustrator who had previously worked on the Marvel Comics adaptation of the series, illustrated The Wind Through the Keyhole. Bernie Wrightson – illustrator for 1960s and 1970s horror comics; he also provided the illustrations for King's novella "Cycle of the Werewolf" (1983). Darrel Anderson – the only Dark Tower illustrator who used digital illustration techniques. Michael Whelan – returning more than 20 years later as the only recurring Dark Tower illustrator. Bill Sheehan of The Washington Post called the series "a humane, visionary epic and a true magnum opus" that stands as an "imposing example of pure storytelling," "filled with brilliantly rendered set pieces... cataclysmic encounters and moments of desolating tragedy." Erica Noonan of the Boston Globe said, "There's a fascinating world to be discovered in the series" but noted that its epic nature keeps it from being user-friendly. Allen Johnston of The New York Times was disappointed with how the series progressed; while he marveled at the "sheer absurdity of [the books'] existence" and complimented King's writing style, he said preparation would have improved the series, stating "King doesn't have the writerly finesse for these sorts of games, and the voices let him down." Michael Berry of the San Francisco Chronicle, however, called the series' early installments "highfalutin hodgepodge" but the ending "a valediction" that "more than delivers on what has been promised." The series has prompted related non-fiction books by authors besides King. Robin Furth has published the two-volume Stephen King's The Dark Tower: A Concordance, an encyclopedia-style companion to the series that she originally wrote for King's personal use. Bev Vincent has published The Road to The Dark Tower: Exploring Stephen King's Magnum Opus, a book containing back story, summary and analysis and The Dark Tower Companion, which includes interviews and coverage of the Marvel graphic novels. Stephen King has endorsed these books. Charlie the Choo-Choo is a "children's book" by Stephen King released in 2016, published under the pseudonym Beryl Evans. It is adapted from a section of King's previous novel The Dark Tower III: The Waste Lands. It was illustrated by Ned Dameron. Several Dark Tower series arcs were published by Marvel Comics. A prequel, The Dark Tower: The Gunslinger Born is plotted by Robin Furth, scripted by Peter David, and illustrated by Jae Lee and Richard Isanove, and is set around the time of the flashbacks in The Gunslinger and Wizard and Glass. The first issue of this first arc was released on February 7, 2007. A hardcover volume containing all seven issues was released on November 7, 2007. The second arc in the series, The Long Road Home, began publication on March 5, 2008. A hardcover volume containing all five issues was released on October 15, 2008. The third arc, The Dark Tower: Treachery, began publication on September 10, 2008. A hardcover volume containing all 6 issues was released on April 21, 2009. Following the completion of the third arc a one-shot issue titled The Dark Tower: Sorcerer was released April 8, 2009. The story focuses on the history of the villainous wizard Marten Broadcloak. The fourth arc, The Dark Tower: The Fall of Gilead, began publication on May 13, 2009. A hardcover volume containing all 6 issues, as well as the Sorcerer One-Shot was released on February 2, 2010. The fifth arc, The Dark Tower: Battle of Jericho Hill, began publication on December 3, 2009. A hardcover volume containing all 5 issues was released on August 17, 2010. Marvel Comics has also published three supplemental books to date that expand upon characters and locations first introduced in the novels. The Dark Tower: Gunslingers' Guidebook was released in 2007, The Dark Tower: End-World Almanac was released in 2008, and The Dark Tower: Guide to Gilead was released in 2009. All three books were written by Anthony Flamini, with Furth serving as creative consultant. End-World Almanac and Guide to Gilead feature illustrations by David Yardin. A five-issue adaptation of King's novel The Dark Tower: The Gunslinger, titled The Dark Tower: The Gunslinger - The Journey Begins, began publication on May 19, 2010. The collected hardback edition was released on January 26, 2011. An adaptation of King's novella The Little Sisters of Eluria, titled The Dark Tower: The Gunslinger - The Little Sisters of Eluria, began publication on December 8, 2010. The collected hardback edition was released on June 8, 2011. 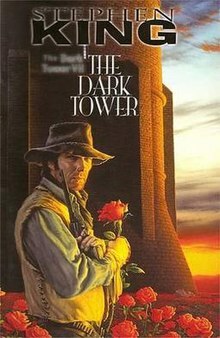 A second adaptation of King's novel The Dark Tower: The Gunslinger, titled The Dark Tower: The Gunslinger - The Battle of Tull, began publication on June 1, 2011. The collected hardback edition was released on January 25, 2012. A third adaptation of King's novel The Dark Tower: The Gunslinger, titled The Dark Tower: The Gunslinger - The Way Station, began publication on December 14, 2011. The collected hardback edition was released on June 27, 2012. December 7, 2009 saw the release of a spin-off online game titled Discordia, available to play free of charge on the official Stephen King website. The game is a continuation of the original Dark Tower story, following the war between the Tet Corporation and Sombra/NCP in New York, and it has been supervised by both Stephen King and Robin Furth. From the website: "Exploring the behind-the-scenes conflict between the two companies, Discordia introduces long-time Dark Tower fans to new characters and numerous mechanical/magical items developed by Mid-World's Old Ones. Over the course of our adventure we will visit many locations, both those familiar to Dark Tower fans and others which we only glimpsed in the Dark Tower novels. While we may not see Roland and his ka-tet in this adventure, the development team has remembered the faces of its fathers. We have done our best to honor the original Dark Tower series while simultaneously mapping new and exciting Dark Tower territory." Sony Pictures and Media Rights Capital adapted the series for film. The film is directed by Nikolaj Arcel, and stars Idris Elba and Matthew McConaughey, cast respectively as Roland Deschain and Walter O'Dim. The film was released on August 4. 2017. Critics panned the film with it receiving a score of 16% on Rotten Tomatoes. The film combines elements from several novels in The Dark Tower series, serving as a canonical sequel to the novel series, which concluded with the revelation that Roland's quest was a cyclical time loop; the presence of the Horn of Eld, which Roland carries in the film, indicates that this is the next cycle; Stephen King has indicated that The Dark Tower film and television series will follow Roland's "last time round" to the titular Dark Tower. In an interview with Collider, Stephen King expressed hope for a sequel film in addition to the upcoming television series, suggesting that it should be R-rated, with Roland wearing a hat, and that it would include the "lobstrosities" from The Drawing of the Three. In an interview with ComingSoon.net, Nikolaj Arcel confirmed that The Drawing of the Three would form the basis for the sequel, and that yet-to-be-cast actors who will play Eddie and Susannah Dean would appear alongside Elba, McConaughey, Taylor, and Haley reprising their roles as Roland, Walter, Jake and Sayre respectively. Currently there exist four audio versions of The Dark Tower series – in English, in German, in French and in Russian. The audio book in English published by Hodder & Stoughton features voices of George Guidall and Frank Muller and has neither music nor sound effects. The audio book in German published by Deutschland Random House Audio introduces Vittorio Alfieri and David Nathan as the narrators. In French audiobooks published by Éditions Gallimard and narrated by Jacques Frantz. In Russian, The Gunslinger, as narrated by Igor Knyazev, does not have any music or sound effects. The multi-voiced audio books should necessarily be mentioned. Being created by Roman Volkov and published by Vargtroms Studio, they contain music and sound effects and make extensive use of voices of children, as well as older persons. Over a hundred actors have already been involved in the process of narration. The sound engineer of the project is Victor Pocotiljuk who is well known for his work with the rock band Aria. Thanks to him, this initially amateur project turned out to be a full-size saga with epic music, sound effects and sound-design. The audio books by Vargtroms Studio often include trailers of the upcoming projects, codas and bad takes. The series has become a linchpin that ties together much of King's body of work. The worlds of The Dark Tower are in part composed of locations, characters, events and other various elements from many of King's novels and short stories. Some of the books that are tied to this series, or that this series references, are It, The Stand, Salem's Lot, Insomnia, Hearts in Atlantis, The Eyes of the Dragon, The Shining and Cell. ^ Mike Fleming Jr. "'Ted' Backer MRC In Talks To Finance Stephen King's 'The Dark Tower'". Deadline. ^ "Popular Writers: A Stephen King interview". neilgaiman.com. ^ "AR BookFinder US". Renaissance Learning, Inc. Retrieved 27 November 2016. ^ "1998 Award Winners & Nominees". Worlds Without End. Retrieved 2009-07-22. ^ "2004 Award Winners & Nominees". Worlds Without End. Retrieved 2009-07-22. ^ a b "2005 Award Winners & Nominees". Worlds Without End. Retrieved 2009-07-22. ^ "USA WEEKEND Magazine, part of USA Today Your Life". Blogs.usaweekend.com. Retrieved 2012-01-09. ^ "Recent News". StephenKing.com. Retrieved 2012-01-09. ^ King, Stephen (2012). The Wind Through the Keyhole: A Dark Tower Novel. New York: Scribner. ISBN 1-4516-5890-7. ^ Breznican, Anthony (July 14, 2016). "The Dark Tower: What the film changes (and keeps) from Stephen King's books". Entertainment Weekly. Retrieved August 8, 2016. ^ "Donald M. Grant". grantbooks.com. Archived from the original on December 9, 2012. Retrieved September 11, 2011. ^ Sheehan, Bill (2007-09-19). "The Return of the King". Washington Post. Retrieved 2007-08-16. ^ Noonan, Erica (2004-01-15). "'Calla' worth the read, but caters to 'Tower' fans". The Boston Globe. Retrieved 2007-08-16. ^ Agger, Michael (2004-10-17). "Pulp Metafiction". New York Times. Retrieved 2007-08-16. ^ Berry, Michael (2004-09-26). "Waiting for the end of their worlds". The San Francisco Chronicle. Retrieved 2007-08-16. ^ "Stephenking.com/discordia". Stephenking.com. Retrieved 2012-01-09. ^ Mike Fleming Jr. "'Dark Tower' Movie: Sony & MRC Partner For Stephen King Adaptation - Deadline". Deadline. ^ Dornbush, Jonathon (June 2, 2015). "Nikolaj Arcel being considered to direct Dark Tower adaptation". Entertainment Weekly. ^ Breznican, Anthony (March 1, 2016). "The Dark Tower rises: Stephen King confirms stars Idris Elba and Matthew McConaughey as production nears start". Entertainment Weekly. Retrieved March 1, 2016. ^ "The Dark Tower - ComingSoon.net". ComingSoon.net. Retrieved 2017-08-04. ^ Saavedra, John (August 7, 2017). "The Dark Tower: Stephen King Easter Eggs and Reference Guide". Den of Geek. Retrieved August 9, 2017. ^ Lussier, Germain (June 20, 2017). "Yes, The Dark Tower Movie Is A Sequel To The Books". Gizmodo. Retrieved August 9, 2017. ^ "'The Dark Tower' Movie Is Actually a Sequel". July 14, 2016. Archived from the original on July 15, 2016. ^ Foutch, Haleigh (2017-08-17). "Stephen King Talks 'The Dark Tower,' Casting Controversy, and Getting Blocked by Trump on Twitter." Collider.com. Retrieved 2019-01-30. ^ Evry, Max (2017-08-07). "Director Nikolaj Arcel Talks Dark Tower Ending and Sequels (SPOILERS)." ComingSoon.net. Retrieved 2019-01-30. ^ "StephenKing.com - Audiobooks - A to Z". stephenking.com. Retrieved 2017-07-02. ^ "Bücher von Vittorio Alfieri". Verlagsgruppe Random House (in German). Retrieved 2017-07-04. ^ "Wind". Verlagsgruppe Random House (in German). Retrieved 2017-07-04. ^ "La Tour Sombre - Écoutez lire - GALLIMARD - Site Gallimard". www.gallimard.fr (in French). Retrieved 2017-07-04. ^ "Кинг Стивен - Стрелок" (in Russian). Retrieved 2017-07-02. ^ "Vargtroms Studio » Электронная Библиотека «Аудиокнига»". audiokniga.org. Retrieved 2017-07-02. "The Oracle and the Mountains"
"The Gunslinger and the Dark Man"
"The Little Sisters of Eluria"
This page was last edited on 16 April 2019, at 00:12 (UTC).